This can happen, if the network or receiver's phone does not handle long messages correctly. Workaround: Send only messages less than 160 characters. Make sure device is not offline or in flight mode. Make sure device has a SIM card, which allows sending SMS messages. Make sure SMS sending works from the built-in messaging application. If the above things don't help, select "Send error log to developers" from the troubleshooting dialog. This opens the email editor. When looking at the log, you may be able to diagnose the problem yourself. Number not valid: The phone number contains illegal characters. 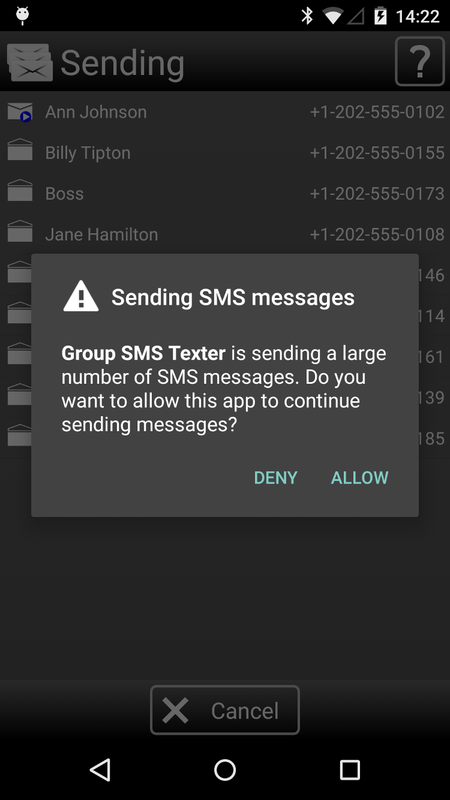 Group SMS Sender supports several number formats, but if you get this error, the safest way to proceed is to use just digits (12345) or plus sign and digits (+3584012345) for international numbers. Radio off: The device radio is off. Make sure the device is not offline or in flight mode. No service: Network reception may be bad or you may be out of your provider's range altogether. Try again in an area with better reception. Null PDU, Generic failure, Exception when sending: Something went wrong while sending. 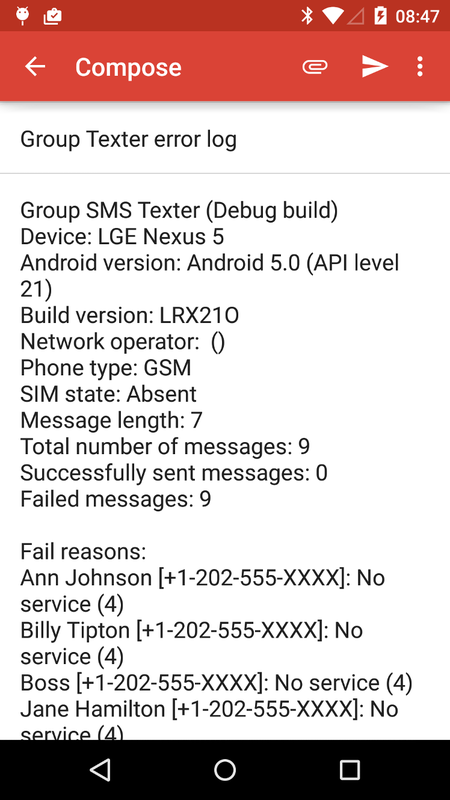 If you get these errors for all messages, SMS sending on your phone may not be correctly configured. If sending messages from the build in messaging application does not work either, contact your network provider for support. Sending the error log to us with additional details about the problem, will help us improve the application and to prevent these kinds of problems in future. Please also note that some Android devices have a limitation which allows you to send only 100 SMS messages per hour per application. This can cause problems when you are sending large number of SMS messages. Unfortunately we cannot override this restriction! If this limit is reached, you will be asked to confirm that you want the application to keep sending the messages.